Print this folded fabric pinecone ornament pattern. Making your own Christmas ornaments is a fun way to get creative during the holiday season. Ornaments make wonderful gifts for friends and family, and they're a quick and easy craft to do, no matter how busy you are. Use these free ornament patterns to add a handmade touch to your holiday tree. If you need help downloading the patterns, check out these helpful tips. This beautiful ornament looks much more complicated than it actually is. In fact, it's entirely made up of folded fabric, a foam craft egg, some ribbon, and floral pins. You can use this simple pattern to properly cut and fold the fabric, and then assembling the ornament will only take a few minutes. 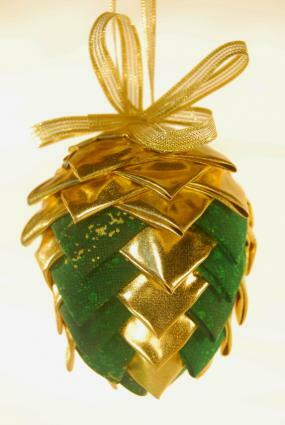 To use the pattern, click on the image of the pinecone ornament. Download the PDF file. Print the PDF, which also includes easy-to-understand instructions and a list of supplies. Cut out the pattern piece and use it as a guide for cutting the fabric. Follow the simple instructions to make this gorgeous design. Print this free straw heart ornament pattern. You can easily add some beautiful country style to your tree using this free pattern for a straw heart ornament. This ornament also makes a beautiful handmade gift topper or present for a special teacher. To make it, you'll need some straw, some red embroidery floss, a pair of scissors, and the free pattern. You can make several of these in an evening, and they're also fun for kids to make. 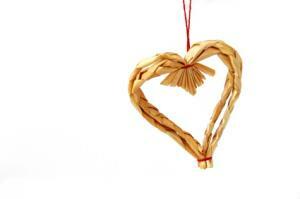 To use the pattern, click on the image of the straw heart ornament. This will allow you to download the free pattern. Print the pattern and go over the instructions and supply list. Purchase the necessary supplies. For this pattern, you don't need to cut anything out. Simply use the heart shape as a template to give your ornament the right shape and size. Print this embroidered felt tree pattern. 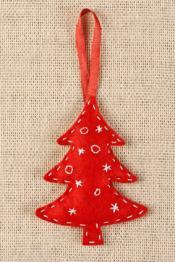 Click on the image of the embroidered felt Christmas tree ornament. Download it to to your computer. Print the pattern and purchase necessary supplies. Cut out the tree shape and use this to cut your felt. Embroider as you like and follow the directions to assemble your ornament. Print this free gold star ornament pattern. 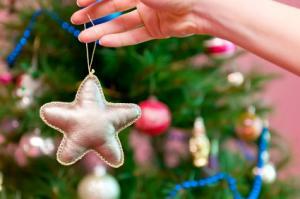 This adorable puffy gold star ornament is a great gift for teachers, and it's a fun choice for your own Christmas tree. Although you create it by sewing, you don't have to have any previous sewing experience to make it. It's a great option for older kids and beginning seamstresses, and you can make up several at once for maximum impact. The free pattern comes with complete instructions and a list of materials, which includes gold fabric, braided trim, stuffing, and thread. To use the free pattern, simply click on the image of the gold star ornament. Then download the pattern to your computer. Print out the pattern and gather up the supplies you'll need. Cut out the star shape and use it to cut your fabric. Assemble according to the directions. Print this 3D felt tree pattern. 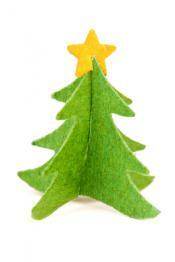 Requiring only felt, ribbon, and hot glue, this three-dimensional tree ornament is fun and easy to create. Because of the hot glue it's not the best project for unsupervised kids, but it does work well for a family crafting session. Make several trees to display as a forest or create just one to hang on your Christmas tree. Either way, you'll love this free pattern which also includes clear instructions. To use the pattern, click on the image of the three-dimensional tree. This will allow you to download the PDF file to your computer. Print the pattern and gather your supplies. Cut out the tree and star pieces and use those to cut your fabric. Use crocheted ornament patterns to create lovely, lacy designs for your Christmas tree. If you're handy with knitting needles, use free knitting patterns for Christmas ornaments to make some cute decorations. Make beaded Christmas ornaments to add a little sparkle to your holiday tree. No matter which ornament pattern you choose, you'll love the special holiday joy that comes with gracing your tree with decorations you made yourself. Crafting together is a fun family activity too, and it offers a welcome break from the hustle and bustle of the busy holiday season.